Obviously, I have had a heck of a day since I’m just now at almost 9:00pm getting around to posting the BOGO of the day. But, you’ll forgive me, right? So, I’ll be quick about it. 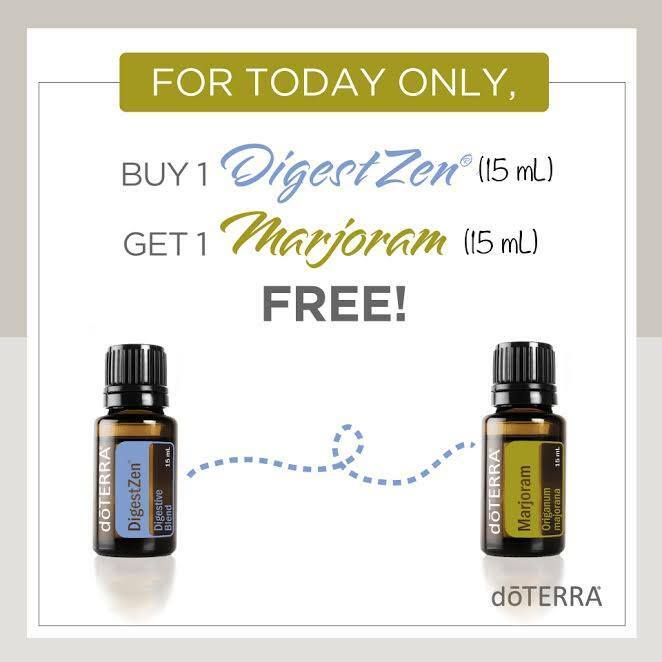 Today only if you purchase doTERRA DigestZen oil, you’ll receive a free bottle of Marjoram oil. Amazing! Now, DigestZen saved my life about 127 times while I was pregnant with baby Sarah. During my third trimester my heart would burn every time after eating, which would then be followed with lovely burps that would burn as well (I know, very ladylike). I was miserable, but then I started using DigestZen in a veggie capsule after each meal. Y’all, it was like the skies opened and angels sang down heavenly tunes. I had so much relief, and in return got much more sleep at night, because it had gotten so bad I was waking up at night. Moral of the story: If you need any sort of digestive support, DigestZen is your best friend. Now, I’ll be honest, Marjoram I don’t have as much experience with, but when I have used it, I liked it. I like to pair it with Peppermint oil and use for aches and pains. It’s great after working out or if you’ve been doing lots of manual labor, like getting a garden ready that you’re super excited to blog about soon. It’s a good one to have in your arsenal when your muscles are crying out to ya! So, don’t miss this opportunity. Go to mydoterra.com/amandagerber and as always, feel free to reach out to me with any essential oil questions! Now, I’m gonna enjoy this glass of ginger kombucha while my kids are sleeping. Good night!